It is with immense sadness I’m letting you all know friend and fellow musician, Robyn Jameson, passed away last evening, July 25. Robyn had been in a coma for the last few weeks due to a nightmarish incident on the street where he was trying to help someone else. Both he and another gentleman witnessed a violent man assaulting a woman. They both went to her aid, and Robyn received the worst of it, receiving severe head trauma & being knocked unconscious. Robyn’s friend and the woman received relatively minor injuries. From all reports, the assailant is in custody and was allegedly not only on parole but is a repeat offender. Due to the wishes of the family and per Robyn’s own ideas of end-of-life situations – with a zero recovery prognosis from more than one doctor – Robyn was taken off life support (respirator, IVs, etc.) on Sunday afternoon, July 22nd. Along with immediate family, Ellen, Bernadette and Justin, friend Jeb, mutual friend/former Flesh Eater (1998-2000) Johnny Ray and I were there. Robyn was one of the few musicians I’ve played with who represented a through-line down through the years, in both several Flesh Eaters line-ups and all Divine Horsemen line-ups, playing bass and making an enormous, versatile contribution in terms of musical ideas. He appeared on the 3rd and 4th Flesh Eaters albums (“Forever Came Today” 1982 & “A Hard Road to Follow” 1983), all Divine Horsemen albums/EPs (“Time Stands Still” 1984, “Devil’s River” 1986, “Middle of the Night,” “Snake Handler” and “Handful of Sand,” all 1987). 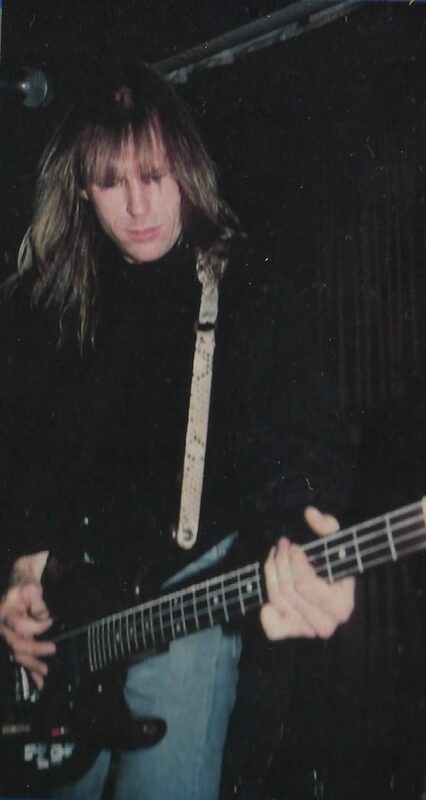 He also played bass on later Flesh Eaters albums, “Ashes of Time” 1999 and “Miss Muerte” 2004, both of the latter being recorded at Robyn’s rehearsal/recording facility, Yo Studios. Due to the 2008 recession and North Hollywood’s ruthless ’eminent domain’ policy for demolition/construction of the Lankershim/Chandler street LA Metro nexus, Robyn lost Yo Studios and moved to San Antonio, where he had many friends, until returning to Los Angeles earlier this decade. He was very excited at the prospect of the forthcoming Divine Horsemen reunion shows that were going to take place at the end of September. Julie Christensen, Peter Andrus and I have decided to postpone these Divine Horsemen shows indefinitely, most likely until sometime in 2019., rather than rush to find a replacement for Robyn’s invaluable contribution. Below are some pictures from various Flesh Eaters and Divine Horsemen photo sessions over the decades. I’ve tagged quite a few people, please forgive me if I absent-mindedly omitted your name.